Obama-file 4 Obama Was Endorsed by Far Left "New Party"
When Barack Obama successfully ran for the Illinois State Senate in 1996(as a Democrat) he was endorsed by the Democratic Socialists of America. A Marxist organisation, Chicago DSA also endorsed three other candidates that year-Danny K Davis (A DSA member and current US congressman), Willie Delgado and Patricia Martin. Obama was also endorsed by the Chicago branch of the New Party. Davis, Delgado and probably Martin were New Party members. What was the New Party? Strong in the mid to late '90s the New Party was an electoral alliance dedicated to electing leftist candidates to office-often through the Democratic Party. Barack Obama was an ACORN man. But back in Chicago, the (ACORN) is more important than Iraq or Washington. 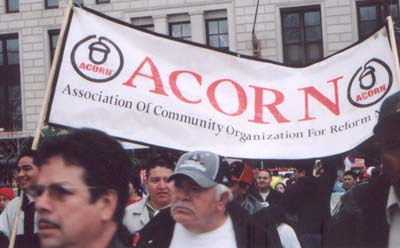 ACORN and its associated Midwest Academy, both founded in the 1970s, continue to train and mobilize activists throughout the country, often using them to manipulate public opinion through "direct action." It's sometimes a code for illegal activities. 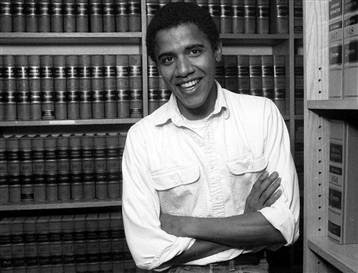 Prior to law school, Barack Obama worked as an organizer for their affiliates in New York and Chicago. He always has been an ACORN person -- meeting and working with them to advance their causes. Through his membership on the board of the Woods Fund for Chicago and his friendship with Teresa Heinz Kerry, Obama has helped ensure that they remain funded well. Since he graduated from law school, Obama's work with ACORN and the Midwest Academy has ranged from training and fundraising, to legal representation and promoting their work. In Chicago, the New Party consisted mainly of ACORN, DSA and the Committees of Correspondence. A breakaway from the Communist Party USA, CoC worked closely with DSA and many activists were members of both organisations. Well known leftist Noam Chomsky is a case in point. Elaine Bernard, a Labor Studies lecturer at Harvard, is a DSA member. The meeting was held at the meeting hall of SEIU Local 880, a local that is tackling the extremely difficult task of organizing home health care workers in Illinois. SEIU Local 880 and ACORN share office space. DSA and their CoC comrades saw the New Party as a vehicle for major political change-to both move the Democratic party leftward and to eventually prepare the ground for an entirely new third party. Carl Davidson wanted to focus on "voting patterns." There were essentially two winners. Naturally the Republicans, but so were the most left in Congress such as the Progressive and Black Caucuses. The latter were re-elected while the neo-liberal and conservative Democrats were voted out. More importantly this election was the de facto defeat of the elitist Democratic Leadership Council who do not care about the poor or Labor. Hence Davidson emphasized that in this historical period the Left's strategy must be electoral politics not revolution. Consequently the Left must galvanize the "majority" - the working class and poor... Moreover the democratic left needs get active in the New Party which has won 20 of 30 local elections. Thus a short-term strategy of working with the Democratic Party and in the long-term work with the New Party. Barack Obama clearly saw the potential of the New Party, because he was soon seeking their support. Although ACORN and SEIU Local 880 were the harbingers of the NP there was a strong presence of CoC and DSA (15% DSA)... Four political candidates were "there" seeking NP support. Barack Obama won the 1996 election, by using legal technicalities to get all his opponents disqualified-but he still used New Party volunteers in his campaign. The NP's '96 Political Program has been enormously successful with 3 of 4 endorsed candidates winning electoral primaries. All four candidates attended the NP membership meeting on April 11th to express their gratitude. Danny Davis, winner in the 7th Congressional District, invited NPers to join his Campaign Steering Committee. Patricia Martin, who won the race for Judge in 7th Subcircuit Court, explained that due to the NP she was able to network and get experienced advice from progressives like Davis. Clearly the young Barack Obama had no aversion to enlisting Marxist help to further his political career. You also might want to add something I caught from my blog on Obama being silent on the endorsement of Louis Farrakhan, Islamo-Marxist leader of the Nation of Islam and also his pastor's ties to Farrakhan. Thanks for that MAH-very useful. You should also mention Obama's anti-American pastor who believes that "white" America "deserved" 9/11 as well who is also a sympathizer of the Islamo-Marxist Nation of Islam though likely not an open member. He still has praised Farrakhan. You may also wish to go in depth on what the Islamo-Marxist Nation of Islam is all about along with their close affiliation in the past with neo-Nazi groups such as the American National Socialist (Nazi) Party founded by the late George Lincoln Rockwell, also mentor of former KKK leader David Duke. Rockwell was welcomed by the NOI to give various anti-Semitic speeches in spite the fact Rockwell was a white racialist. But I guess it seems that black racialists like those in the NOI and white racialists like neo-Nazis such as Rockwell don't have much of a difference. This slander of American President Obama is not helpful for our new Prime Minister John Key i9n establishing relationships between our nations. USA has always pursued an unusual foreign policy with President Roosevelt warmly endorsing Stalin in 1943. Or the support of the New York establishment of a 1919 Red Cross mission to USSR (John Mott) while earlier the same group had facilitated the return of Trotsky from New York to Russia in time for the revolution. It will be a relief to see the war end in Iraq and relations restored with Cuba and Venezula etc with the new US President. It may take time to adjust to a new ear in US foreign relations but CHANGE is happening! What in this post is untrue? Are you suggesting I should suppress the truth for the sake of diplomacy? Paul, Barack Hussein Obama is NOT the American President and, God willing, shall never be. Part of the American presidential selection process is for opposing sides to dig up and sling as much mud as possible to see what actually sticks. Apparently Obama is knee deep in his own mud. At any rate, slander is most difficult to prove especially with a public persona. You are most welcome and keep up the great articles! Notice the "house parties" that are mentioned. This is EXACTLY the time that Ayers hosted Obama's first campaign event. I just heard Obama say on a radio program from yesterday that (regarding Ayers) "I assume...uh...he's been rehabilitated". In 1998 Ayers and Dohrn still said they didn't do enough. They were just idealistic. "We'd do it again. I wish we'd done more." The fact that he knew them isn't the problem; that's just Chicago politics. It's the fact that he thinks that that kind of Machiavellan amoral approach qualifies him to be my President. I am sick to my stomach over this Marxist. He is the ONE the Marxists have been waiting for, and they are just this close. Greetings from the US, my New Zealand friends. I'm glad to see that others in the free (for now) world are also concerned. There is something not being sufficiently focused on with regard to Obama’s connection with Ayers. That is this: think of the loss of credibility our nation will have in a war on terror, when its chief executive-- nay, its Commander in Chief-- has ties to, indeed launched his political career in the home of, a confessed and unrepentant domestic terrorist. The American people need to reflect soberly on the moral effect such an association will have on the legitimacy of our war against terrorism. If people don’t think that every terrorist state and organization in the world won’t make hay with that, they are delusional. It doesn’t even matter if Obama agrees with or condemns Ayers’ actions. The association is sufficient for the terrorists to exploit. Period. No one seems to be addressing the “why does it matter” aspect (beyond simply bad judgment). I’ve been doing my best to keep up with most of the articles on this subject through RCP, but I don’t think anyone has really driven this home. I really think this is the angle that needs to become a drum beat, and just hammered home until election day. It’s not guilt by association, it’s irreparable damage to our nation’s moral credibility in time of war against terrorist states and organizations. From reading Newparty websites I noticed something. The Members they help get elected run campaigns called insurgent campaigns. Insurgent meaning Person who challenges the current state of affairs. An insurgent group is one that seeks to overthrow the present leadership or regime and install a new order. example can be found here. Newparty is the workingfamilies party. Now look what Obama says in this article. read it carefully. As a political writer and researcher in the U.S., I can tell you that the presidency of Barack Obama leaves more questions than answers. As you may know, there was a lawsuit against Obama by a prominent Democrat over the issue of Obama's citizenship. To date, Obama has never produced a legitimate vault copy of his birth certificate. His paternal grandmother is on audio tape saying that she was present at his birth in Kenya. He traveled in 1981 to Pakistan on his Indonesian passport. A candidate for president must be a natural-born U.S. citizen. The Supreme Court has given the Obama people unti Dec. 1st to produce the certifided document. Most likely, it doesn't exist. There are numerous questions about Obama's ties to surrogates of terrorist organizations and radical domestic organziations. His medical, academic, bar association and Illinois senate records have all been sealed. There has been no transparency in his campaign. His supporters are ignorant of the importance of answers to these many questions.